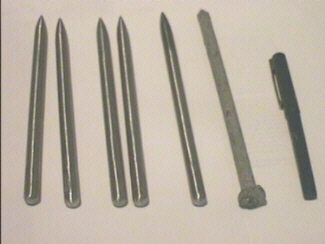 You start with large nails, (or "spikes" as the hardware industry calls them when they reach the size useful for throwing). I picked up some 8" galvanized ones. There were ones 12" long but I figured I would start small. First I took a hacksaw and cut the "heads" off the spikes. At this point, I held the already pointed end of the spike to my Delta 6" wheel grinder in such a way as to get a nice taper with a good point on it. I kept rotating the nail while LIGHTLY grinding off metal and shaping the point. A bit of artistic creativity is helpful here. You don't want too sudden of a taper or it won't penetrate well, while at the same time, a sharp, needle-like taper can dull and bend more easily. Holding the spike horizontal to the belt, I again rotated the spike while lightly making contact with the sanding belt. I worked the spike back and forth until I had sanded off all of the galvanized coating and had a nice smooth steel surface. I also touched up the back of the spike where I cut the head off in the beginning and rounded it off, first on the grinder and then on the belt sander. Depending on the grit of the sandpaper belt, you can finish the surface of the spike off even smoother with finer grit sandpaper, or leave it dull for a better grip. I experimented with one spike by polishing the galvanized coating off and then, using gun bluing compound, blued it. It looked really wicked, but the smooth coating made it tricky to grip and release properly. So I ground in some ridges on it and now it is fine!